3. But that is not the only thing you have to look after. 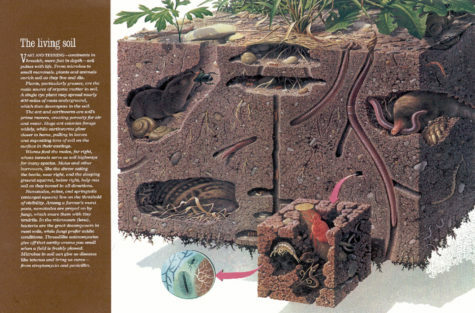 You have to make sure that you are servicing the ecosystem: capturing the maximum amount of energy, that the water cycle works for getting it into the ground, that the mineral cycle works well — and that is a biological function as well — and you need the right mix of species in there. You need to manage the area for all these things to work together. 5. Here is a picture of that close up, where you have the soil and grass. The tall stuff is left up because the cattle keep eating the green stuff down below. How is the energy being captured in that scenario? Reasonably in some places, but certainly not in all. Nutrient cycling is poor in some, okay in others. 6. 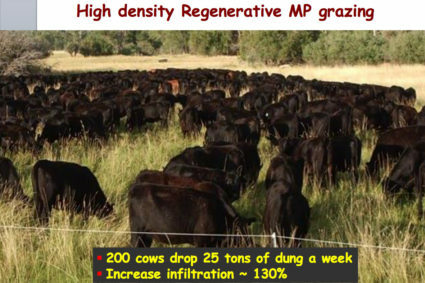 But many graziers are using regenerative Multi Paddock grazing. By that I mean graze for a short period of time, move the cattle on, and allow adequate time for grass recovery. The best success in improving things is by using this technology. 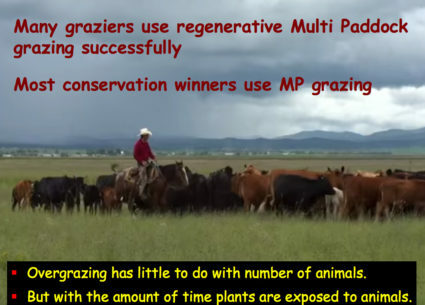 Most conservation winners use multi-paddock grazing of sore sort. 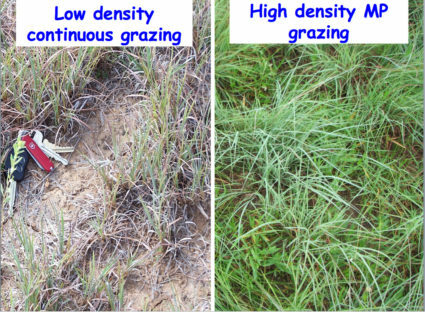 Overgrazing has little to do with the numbers of animals, but it has everything to do with the amount of time animals spend on a particular piece of territory. If they are on a large area they scorn eating what is available and end up eating the hell out of certain spots. You need to remove them periodically to get around that. 7. The way you get around it is that you subdivide and put water in where you need to so you can control each paddock. You put the herd in, you graze moderately and you graze tall, and then you get off until it has recovered. That way all the ecosystem functions are kept operating reasonably well and you can improve matters. I’m involved in a group down in Patagonia where, as soon as you put in one of these programs the wildlife just flocks to the area because they are speeding up the nutrient cycling and they are keeping it moderately green. That just keeps things going. All you have to do for the wildlife goals is write them into your annual plan and execute them along with your change in grazing management. In that way, because of the landscape, you can spread the grazing and get all of the ecosystem services functioning really well. 8. In that way you can take this situation where most water just runs off and you are losing carbon from the soil to one in which you are gaining in both water and CO2. That is in about a 12 inch rainfall area. 9. 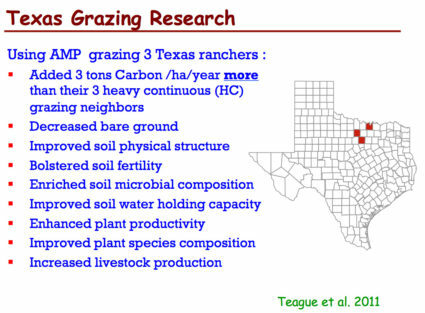 Texas, in those 3 counties, we had 3 ranch treatments in each: light continuous grazing, heavy continuous grazing, and multi-paddock grazing. 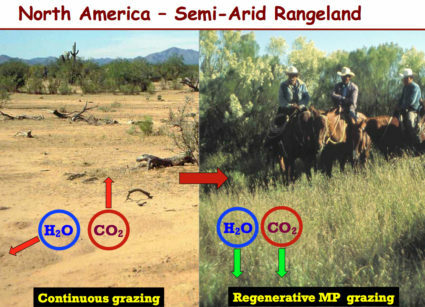 The multi-paddock grazing added three tons of carbon per year more than the heavy continuous grazing counterparts. That is a lot of carbon! Also, the decreased bare ground improved physical structure, bolstered soil fertility, enriched soil microbial composition (particularly the fungal component), improved water holding capacity, enhanced plant productivity, and improved species composition. Plus productivity increased! 10. So, causal mechanisms. Energy capture in the multi-paddock area is fantastic. And you keep it that way for longer through the year than in a lightly grazed area operating with half the cattle numbers. 11. Here on the left is low density continuous grazing. You get a lot of bare soil. The cattle concentrate in some areas and push the plants back. In contrast, in multi-paddock grazing there is very little bare ground and there is a lot of litter cover under there. The litter cover looks after the soil microbes and everything is ticking along very nicely. Whereas only a certain portion of the pasture is ticking along well on the left. 12. 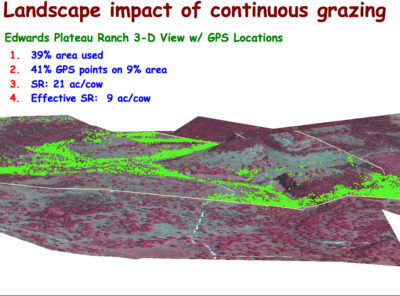 Here is a choice between multi-pasture grazing and no grazing. A lot of environmentalists will say you need to take down livestock altogether. On the left, this has all the old prairie species and lots of litter cover. It is grazed moderately and then given a long recovery. All the right plants are there, as well as all the ecosystem services. Here, after about 30 years without grazing, the plant cover is dominated by big bluestem and little bluestem. Both are fantastic grasses, but there is almost nothing else. There is bare ground between the tufts. A big clump grows up and nothing takes the stuff away. If you burn it of course you do that, but you still have bare ground underneath it. 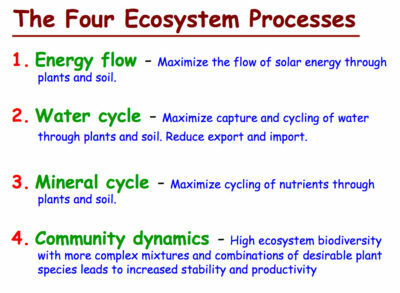 Although it might sound good, it does not give you all four of those ecosystem services. 13. 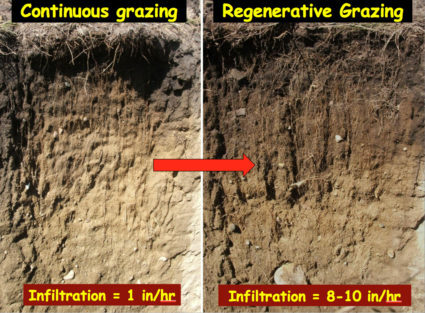 So, continuous grazing, look at the soil color change there. Then look, after 7 to 10 years of regenerative grazing, how much darker it gets. And infiltration rates – on the left, one inch an hour. On the right, with regenerative multi-paddock grazing, 8 to 10 inches an hour. Gabe Brown is one of the guys who’s soil measurements we have captured. He is achieving exactly the same results. 14. 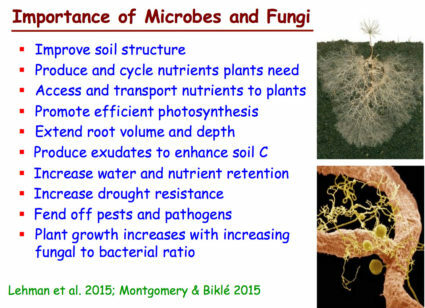 The importance of Microbes is they provide improved soil structure, provide nutrients and access to the nutrients, promote efficient photosynthesis, extend the root volume, produce exudates and enhance soil carbon, increase water and nutrient retention in the soil profile, increase drought resistance, fend off pests and pathogens and increase crop growth with increasing fungal to bacterial ratio. When you have a large variety of species, and they are green for a large portion of the year, that is what fungi need! They work for you in getting phosphorus and other things available that you wouldn’t otherwise have. 15. 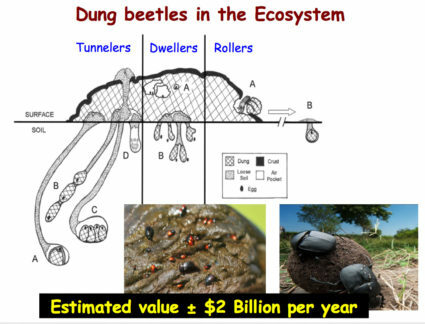 Another big component is dung beetles. There are three different kinds: tunnelers, dwellers, and rollers. The value they create is estimated in the billions of dollars every year. They create these channels that enable water infiltration, as well as improving and recycling the nutrients. If you use continuous grazing there won’t be that many of them. Plus, if you use insecticides — like Ivermectin – you kill them off. Then you’ve lost a product of value on your property. 16. 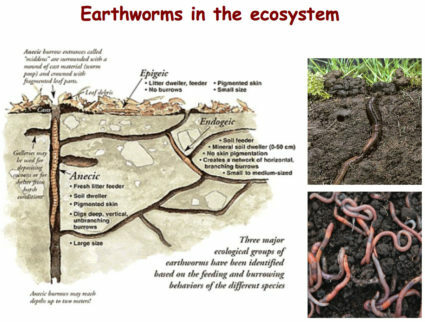 The same is true of earthworms. They provide the same functions and improve productivity enormously. For a lot of them you have to have the right plant populations and manage them in a manner that encourages them. 17. Multi-paddock grazing is a method of management that works pretty well You can get 200 cows to drop 25 tons of manure per week. That increases water infiltration by 130 %. It is a strong driver of moving soil conditions in the right direction. 18. 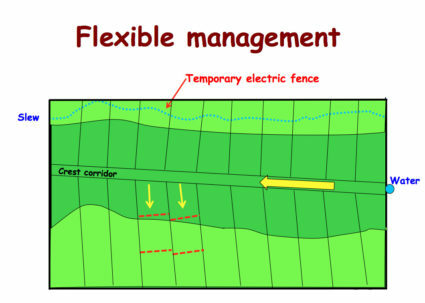 Flexible Management – Here is a drawing of a system by a grazier in Canada. It gives the herd access to water at the end of the corridor, and paddocks that are suitable for one day’s grazing. He actually gives the cows one paddock split into three and they are moved three times in one day. By doing that, he has achieved that change from a one inch infiltration to ten inches of infiltration in a period of about 8 years. 19. 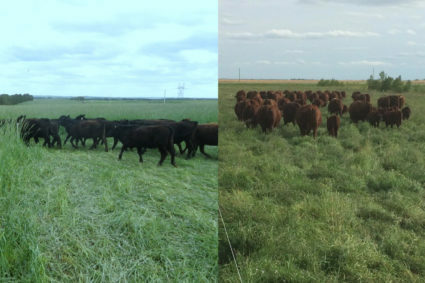 Here is a picture of the cattle on the left moving off from an area they have been grazing, and on the right coming in to a new area. Many people would think the grass that they have knocked down on the left is totally wasted. No its not! One of the things that they have learned from this system is that when the grass is getting ahead of you in the summer you need to put a whole lot of it underground and that feeds the microbes and the earthworms, which improves your whole pasture. It is not wasted at all. It is just paying forward. In the spring, of course, you don’t try to leave this amount because it is just coming up. But as the grass picks up speed in its growth and gets ahead of the cows, you need to put a lot of it on the ground to start feeding the microbes. 20. For over a hundred years we have been working in North Texas measuring the output of water. 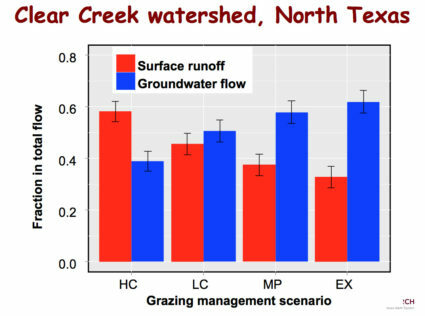 What we have here is a model showing the surface runoff with heavy continuous grazing, light continuous grazing, multi-paddock grazing, and exclosure or no grazing at all. 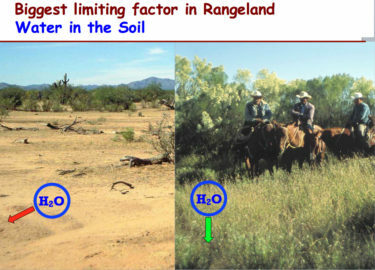 You will see the runoff is much higher than the groundwater flow in the continuous grazing systems. 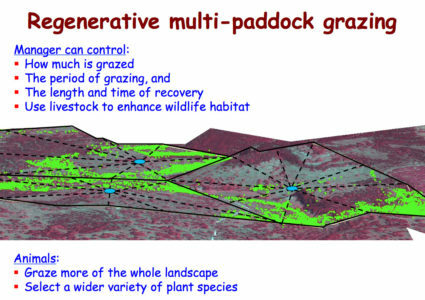 The multi-paddock and exclosure systems are functionally the same. If you look at the graph of the ungrazed area with the dead grass, that is fantastic from a water point of view, because most of it is getting into the ground. But what happened to the nutrient cycling and the species diversity? It is very low on those scores. So that is not too good from a total management point of view. 21. 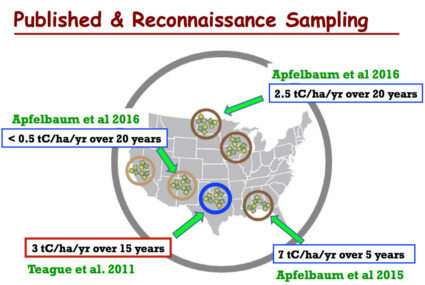 These are results of a number of studies of carbon sequestration by multi-paddock grazing systems sampled across an East/West or wet/dry axis and a North/South or cold/hot one. In Texas we had 3 tons of sequestration per year over 15 years. In Georgia and Mississippi it is more than double that amount in fewer years. In the north we fixed a little less because we had a shorter growing season, but it was still substantial. And in the dry country you get much less effect. But even though you have less carbon being fixed there, the infiltration rates are hugely increased. We have found that when you institute good management the first thing that it increases when you cover the ground is that the biology comes right and you start getting better structure and the water comes into the soil. It will take many years of that in the dry country before you can measure the changes in carbon. 22. A lot of people don’t like cattle because they say they don’t like the emissions from cows. These two graphs are from work done in the northern plains. The red is the amount of Greenhouse gas equivalents emitted per hectare per year (which is dependent on the number of cows involved, however grazed) and the green is the amount sequestered by the plants they are grazing. These are grazing only cow operations, not including any grain-fed cattle. 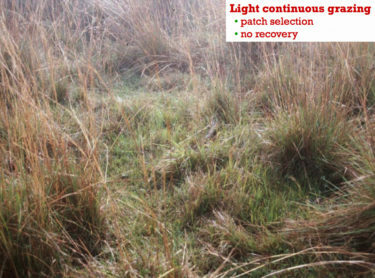 On the left is the light continuous system which shows the advantage of grazing on grass. On the right here is the heavy continuous system, which is not to be recommended, but even that sequesters more than is being emitted. 23. 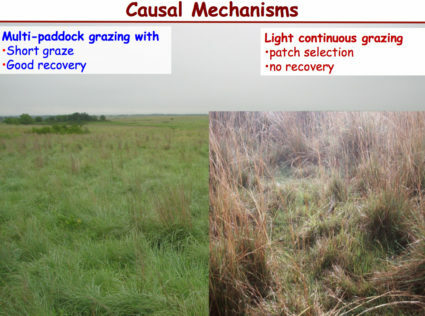 Coming to the research that we did on changing management, if you change light continuous to multi-paddock grazing there is a small advantage. 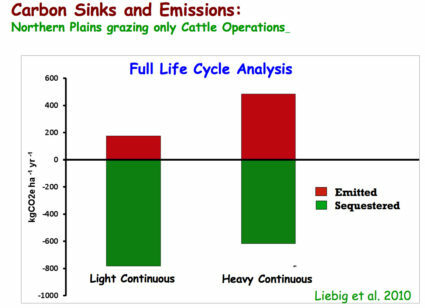 If you change heavy continuous to light continuous there is a huge advantage because of the extra carbon sequestered by light continuous and of course there are fewer cows so there are less emissions, and if you change heavy continuous to the same number of cattle with multi-paddock grazing, you have a huge increase in the amount sequestered which more than offsets the amount being emitted by the cattle. Many of the studies don’t take these factors into account. 24. We also looked at cropland. This is work done by Gabe Brown. When he started off he had organic matter of about 1.7% and an infiltration rate of about an inch an hour. Moving from no-till (ed: Gabe was not practicing organic no-till then, but rather no-till using herbicides) to cash crop diversity, integrating a cover crop, then more species in the cover crops, and eventually bringing in crop rotation with animals grazing in a multi-paddock system he had an increase in organic matter from 1.7% to 11% — all those things together moved him in the right direction. 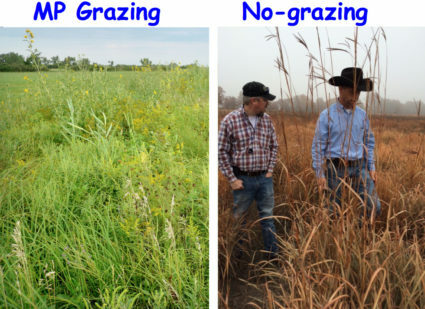 These are the elements that you need in a pasture to manage for to increase production. A lot of the current practices like the use of fertilizers and pesticides diminish your ability to put carbon in the ground and actually decrease the amount in the ground. So you have to get away from those practices. In cropping systems it is pretty much the same. Minimize mechanical disturbance. Cover the soil all the time with plant cover. Use higher plant diversity so you are popping energy and carbon in the ground all the time. Integrate livestock into crop planning. Use cover crops to jump forward the rate of adding carbon to the soil enormously. These are all the practices that are beneficial. Agriculture could be a net sequesterer if we adopted some of these things more widely! W. Richard Teague is a range ecologist with Texas AgriLife Research. He grew up and received his schooling in Zimbabwe, Africa, receiving his BS (1972) in Grassland Science, from the University of Natal, Pietermaritsburg, South Africa and Ph.D. (1987) in Botany-Ecology at the University of Witwatersrand, Johannesburg, South Africa. He has practical and research experience in grazing management systems, brush control with fire and chemicals on semi-arid rangeland in Africa and North America. He joined the Texas AgriLife Research and Extension Center at Vernon in late 1991 as an Associate Professor.